The first half-hour or thereabouts of Comforting Skin is annoying in the extreme. It feels like it’s going to be just another mumblecore movie (not even a mumblegore movie because, you know, no violence). You know the drill. Annoying characters you can’t stand doing things they couldn’t afford in the real world without anything much really going on around them. And then Koffie (Good Luck Chuck‘s Victoria Bidewell), our main character, gets her tattoo. And everything changes. Posted in Movies, Reviews and tagged 2010s, fantasy, horror, three-and-a-half-stars. Bookmark the permalink. Despite only giving Emily Hagins’ first feature, Pathogen, three stars (but let’s remember, three is still “above average” on a five-star scale), I unhesitatingly recommended it in my review because, well, it’s a zombie movie that was made by a twelve-year-old and, aside from having basically no budget and some problems with acting ability, was a clever, fun take on the genre. Hagins returned five years later with her third feature, My Sucky Teen Romance, a teen vampire comedy whose purpose is to make fun of teen vampire comedies. And my favorite thing about it is that in every way, it’s obvious Emily Hagins took Pathogen as a learning experience. My Sucky Teen Romance is a much better movie technically, with much more solid acting and a clever script (written by Hagins). 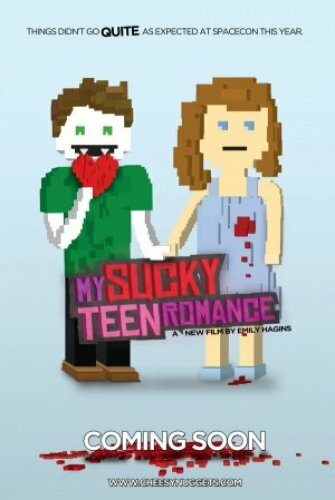 In short: if you like your teen comedies with more romance than raunch, My Sucky Teen Romance is for you. Posted in Movies, Reviews and tagged 2010s, child-and-young-adult, comedy, romance, three-and-a-half-stars. Bookmark the permalink. Posted in Books, Reviews and tagged 1950s, 1960s, 1970s, 1980s, 1990s, 2000s, 2010s, half-a-star, one-and-a-half-stars, three-and-a-half-stars, three-stars, two-and-a-half-stars, two-stars. Bookmark the permalink. Never bite the hand that bleeds you. There a number of directors who have become canonical over the years whose films I have simply never gotten. Woody Allen. Mario Bava. Sam Fuller. Every time I dig into a Fuller movie I try and see what it is that sets him apart, and every time I fail. 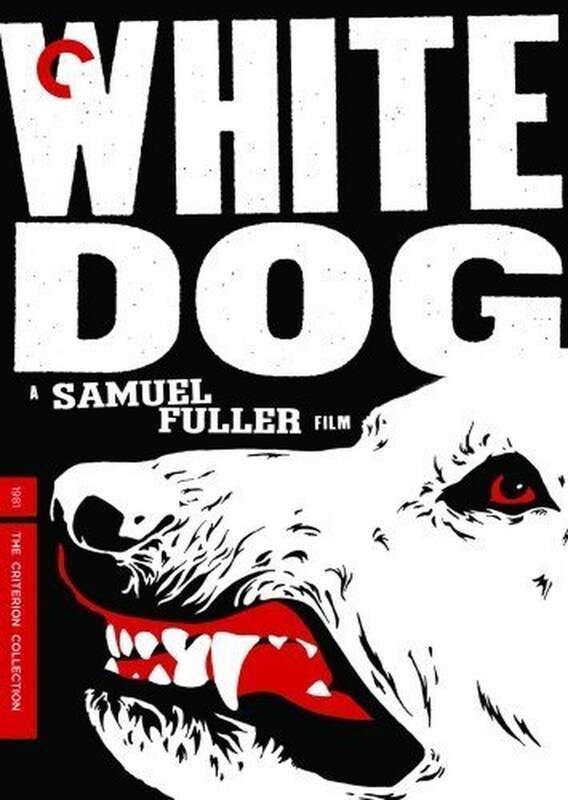 My most recent attempt was with the 1982 racism melodrama White Dog, and I think that perhaps I’ve figured out what the canon sees in him. I still didn’t get to the “all that and a bag of racists” point with this one, but it’s starting to make sense. The thing about Sam Fuller’s strain of melodrama, if I’m right in my hypothesizing, is that in movies like Shock Corridor and Pickup on South Street, both of which left me kind of cold, Fuller was doing that gig first; Douglas Sirk and Grace Metalious and Russ Meyer and all that lot would come after and hone the genre, so that when Fuller returned to the fold in the eighties, he not only had his own base to work from, he had everyone else’s, too. And I think that, more than anything, may be what impressed me about White Dog: Fuller wasn’t afraid to build on the work of others, rather than focusing obsessively upon his own corpus. Posted in Movies, Reviews and tagged 1980s, drama, three-and-a-half-stars, thriller. Bookmark the permalink. We get ’em out the old-fashioned way! 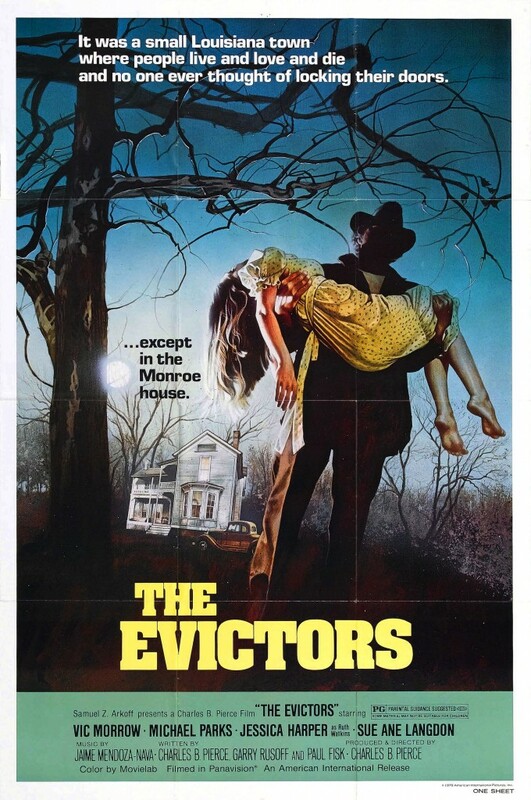 There are a whole lot of directors at work in America today who should be sat down—with as much force as necessary—and made to watch The Evictors, which is an excellent example of how to make a stylish, effective thriller on a basement budget. But since that’s not going to happen, I can distill what they need to learn from this movie into a single sentence: look backward, not forward. Look, if you dare, at the plague of Asylum pictures and Syfy Original Movies and all that sort of dreck, and one thing you will likely notice is that everyone’s waving around CGI like it’s a brand-new toy they can’t get enough of. It’s a very loud, flashy toy, and it annoys the hell out of mom and dad five minutes after the box is opened. Now watch the opening sequence of The Evictors, which is filmed in sepia-tone; the sequence takes place in the thirties, and Pierce was going for that kind of look. It’s very well-shot, it’s obviously out of place, and it does what it sets out to do. If this movie was made in 2013, that sequence would probably be CGIed to death, and the movie would be the worse for it. This is not to say that The Evictors is a perfect film, not by any stretch of the imagination, but for what it is, it is a very good one. Posted in Movies, Reviews and tagged 1970s, three-stars, thriller. Bookmark the permalink. 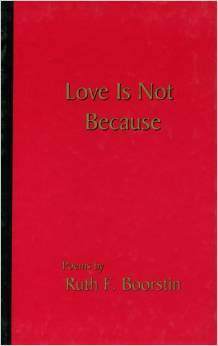 Love Is Not Because This Book Has a Fire-Engine Red Cover. Ruth F. Boorstin, the About the Author blurb tells us, was the wife—and longtime editor—of Daniel J. Boorstin, a Pulitzer Prize winner, Library of Congress librarian, seller of many, many books. You have likely heard of Daniel Boorstin. Unless you aware aware of the minutiae of his life, you have probably never heard of Ruth. Having now read the horrifying Love Is Not Because, I know why all too well. Posted in Books, Reviews and tagged 1990s, one-star, poetry. Bookmark the permalink. Had I been planning on giving this any stars, it would have lost them for incomplete information. I thought I took the road less travelled, but then I realized that wouldn’t be the case with this much landscaping. Vanity-, POD-, and Self-published poetry comes in two flavors, with no middle ground: it’s either really, really good or really, really bad. If you are familiar with vanity-published work at all, you are probably not surprised by the idea that 90% of the vanity-published books you will pick up are of the latter flavor. When it comes to poetry—and I will admit right up from that my criteria for what makes a great poem is far, far stricter than it is for prose—that number tends to be closer to 99%. Now, why am I telling you all this? Well, there’s the kicker. 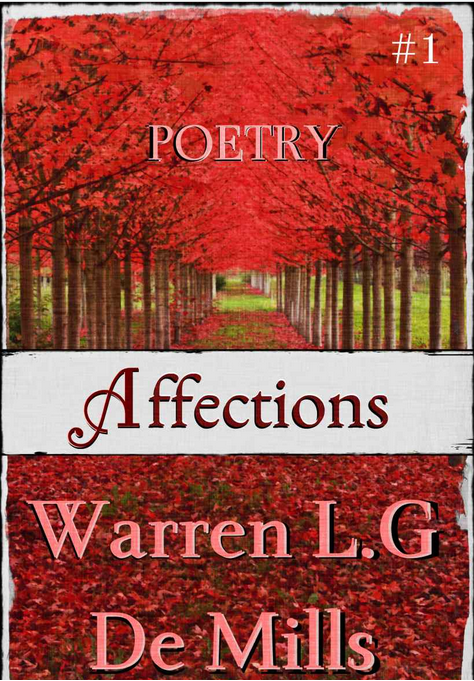 As I write these words at the end of September 2014, Affections has eight reviews at Amazon. One of them is a three-star review (which to me means “lightly recommended”, since 2.5 is the average). All the rest are either four or five stars. So this has got to be one of the one percent, right? Posted in Books, Reviews and tagged 2010s, poetry, zero-stars. Bookmark the permalink.